Are you looking for the right accessories for your tux or suit? Do you want to elevate your everyday style and make your outfit unique? Do you need a nice set of accessories for your little one's formal outfit? Well, look no further because the JAIFEI bowtie and suspenders set for boys and men is exactly what you were looking for! You can find the matching accessories set in 16 colors that vary from classic and neutral to vivid and fun colors. The bowtie and the matching suspenders are the classic accessories that will never go out of style and that every man should have. These accessories can elevate any outfit and make it incredibly elegant. The JAIFEI suspenders are ideal for every occasion, both formal and casual. Wear them on weddings, parties, black tie events or even at work or for a casual drink with your friends. The bowtie and the suspenders will give your outfit a bit of luxury and make you stand out from the crowd. The JAIFEI accessories for men and boys are carefully constructed with special attention to detail so we can give you the best. The suspenders have PU leather details that are not only elegant, they're also very strong. The heavy duty clips are strong and they have plastic teeth that are safe for children. FOR EVERY LITTLE OR GROWN GENTLEMAN: This suspenders and bowtie set for boys and men is the great choice for every outfit and occasion. The set comes in 2 sizes, one for men (1''x47'') that can fit almost every adult and one for boys (1''x33'') that is perfect for children 1-8 years old. The high end set comes in 16 color options and it is perfect for all men, small or grown! INCREDIBLE ELEGANCE: These accessories for men and boys were designed to perfection so you can elevate any outfit and add some elegance to your look. These classic accessories will never go out of style and they will always look incredible. The suspenders have high end PU leather details for that extra touch of luxury. The matching accessories come in a wide variety of colors, from vibrant and fun to neutral and classic. Choose the one that suits you and elevate your style. CONVENIENT DESIGN: These accessories are not only incredibly stylish, they are very practical too! The bowtie is pre-tied so you will not have to waste any time tying it up and so that it can always look absolutely perfect. 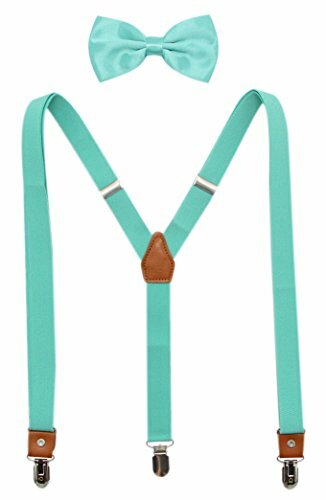 The suspenders have strong clips that will keep your clothes in place and plastic teeth so that they can be safe for children and not leave a mark on your clothes. IDEAL FOR EVERY OCCASION: No matter where you're going or what time of day it is, this beautiful suspenders and bowtie set will make the perfect addition to your outfit. These accessories are great for formal events such as weddings, parties or black tie events and they can even be worn in a casual outfit during the day to add some unique style to your everyday outfit! Choose one of the 16 colors to match the occasion and your outfit and impress everyone with your sense of style. ORDER WITH CONFIDENCE: With JAIFEI you can rest assured that you're getting only the very best. Your satisfaction matters and this is why we offer you carefully crafted high end products. If for any reason you are not completely satisfied with our bowtie and suspenders set, we will give you a full refund - just let us know within 45 days, we'll be happy to help you! View More In Ties, Cummerbunds & Pocket Squares. If you have any questions about this product by JAIFEI, contact us by completing and submitting the form below. If you are looking for a specif part number, please include it with your message.